William Lee invented the first knitting machine in 1589 in England. Since then, such machines have evolved and been refined in many ways, all toward the purpose of making knitting easier and faster. Modern knitting machines are much simpler to use and much smaller. The Innovations knitting machine allows you to produce a flat or tubular piece of knitting in stockinette stitch. It weighs less than 4 pounds, is made of plastic and works best with midweight and lightweight yarns. 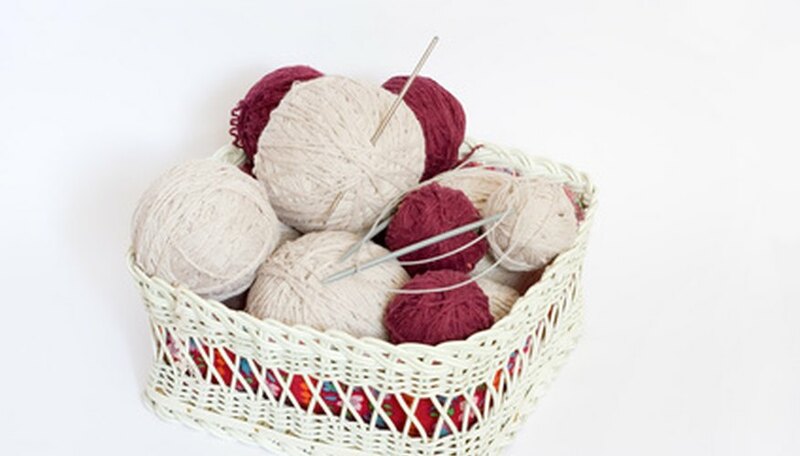 Wrap the yarn into a ball. Place the ball into an empty coffee can. Cut a hole in the lid of the coffee can. Pull one end of the yarn through the lid. Secure the lid to the can. Flip the switch on the knitting machine to the up position to make flat panels of knitting. Flip the switch to the down position if you want to make tubular panels. Pull the end of the yarn through the middle of the machine. Hold the yarn in your right hand. Hold the crank part of the machine with your left hand, and wind the free end of the yarn over the colored hook as you turn the crank slightly so that it will catch. Wrap the yarn behind the hook to the left of the colored hook. Continue wrapping the yarn, alternating under or behind each successive hook, until you reach the hook where you began. Wind the yarn under that hook a second time. For tube-panel knitting: continue wrapping the yarn behind and under the next five hooks. For flat-panel knitting: Thread the yarn behind the next hook. Then crank the machine until it will go no farther. Thread the yarn through the yarn guide. Pull the yarn down firmly though the center of the machine, but do not pull very tightly. Pull the yarn through the tension guide from top to bottom, into the half-circle mark inside the yarn guide. Pull the yarn through the opening on your left side into the first rung, then through the indentation on your right through the second rung. Pull the yarn again through the opening on your left side through the third tension rung. If you are working with a very thin yarn, pull it again through the opening on your right through the fourth rung. Turn the hand crank and the machine will pull the yarn in evenly to create the knitted fabric. Continue to turn the crank until the knitted piece is the length you desire. Remove the finished fabric from the machine. Cut the yarn, leaving about 2 feet of length (measure with a measuring tape). Thread a yarn needle with the end of the yarn. Using the yarn needle, pick up the stitch you want to end with, and continue picking up stitches, moving in the direction that the machine knits in. Each time you pick up the next stitch, return the needle to the inner part of the machine and move it outward, sewing from the inside of the machine toward the outside. When you have removed the last stitch, pull the yarn tight and tie a knot. Sew the tail of the yarn into the finished piece so it will be hidden. If it is hard to turn the crank of the knitting machine, remove the yarn from the lowest-tension rung. Do not allow the yarn feeding into the machine to become too taut.